"These individual bites are simple to make, tasty and enjoyed by my entire family, which includes my 18-month old twins." Preheat an oven to 350 degrees F (175 degrees C). Grease a 12 muffin miniature muffin pan. Heat the oil in a large skillet over medium heat. Stir in the onion and bacon. Cook until onion is translucent and bacon is browned, about 5 minutes. Stir in the carrot and zucchini; cook until they begin to soften, about 2 minutes. Transfer mixture to a bowl to cool. Beat the eggs, cream, and Parmesan cheese together in a large bowl. Season with salt and pepper. Stir egg mixture into cooled zucchini mixture; stir in flour. 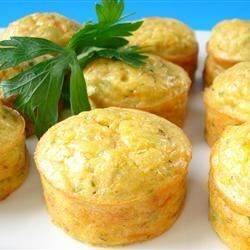 Spoon the batter evenly into the prepared muffin cups. Bake in preheated oven until a toothpick inserted in the center comes out clean, 15 to 20 minutes. I didn't have self-rising flour but you can make your own. For ONE cup of all-purpose flour, add 1 1/2 teaspoons of baking powder and 1/2 teaspoon of salt.